Oil painting on canvas 24″x30″ by Clina Polloni. 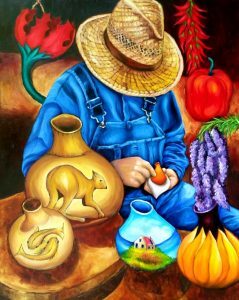 This oil painting is in honor to all the gourd artists of North Carolina that works their craft in silence. Gourds by Deb Allen and Clina Polloni Allen. Clina Polloni is a contemporary artist born in Chile. Her oil paintings are inspired by her love for people, animals and nature. Her new project: “The motif of the human figure in a dialogue with natures light and colors.” In these new paintings she is portraying the people of North Carolina in their environment and activities, representing history in the arts of our state. 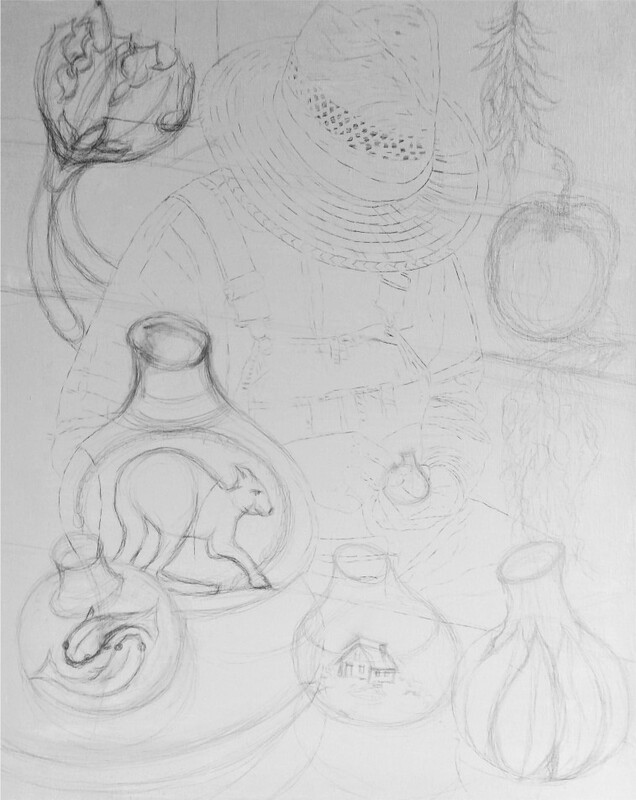 Start by drawing the artist and the gourds defining the light and the shade. Do your under-paint or imprimatura with a wash of acrylics using raw sienna with white and colors that are going to be helpful when painting with oils. Acrylics are very good for under-painting because they dry faster. 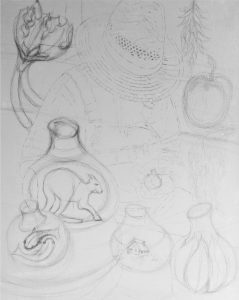 The under paint is very important because you are drawing with colors and defining light and shade in your final painting. The imprimaturais an initial stain of color painted on the canvas. It provides a transparent, toned ground, which will allow light falling onto the painting to reflect through the paint layers. 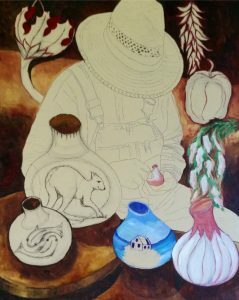 Using oils, start painting the objects that are in the back ground of the artist. Using oils paint the artist, his wicker hat, hands and overalls. 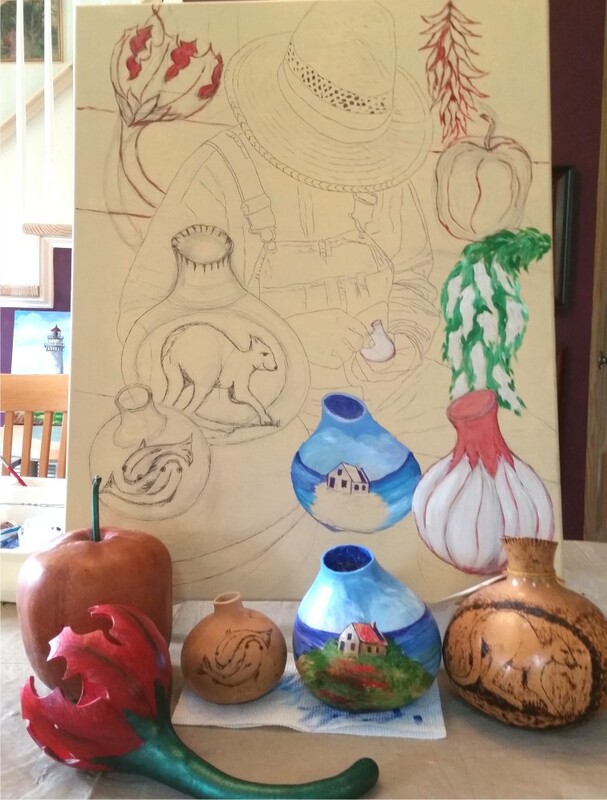 Paint the gourds, flowers and hot peppers.